Beautiful panoramic mountain views as far as the eye can see! Leather furniture & wood fireplace makes the living area inviting. A stone wood burning fireplace to warm by. Prepare a family meal in this fully equipped kitchen that is open to the living and dining area. Play a game of foosball while enjoying the cozy fire! Another view of the foosball table and kitchen at Above It All. The main level bedroom offers a Queen bed & Satellite TV. Upper level, queen bedroom with full bath & TV. Views abound from Above It All. The spacious deck offers long range views, grill and plenty of seating. Rainbows in the mountains will have you awe-struck! Enjoy the common area with pond and picnic tables. 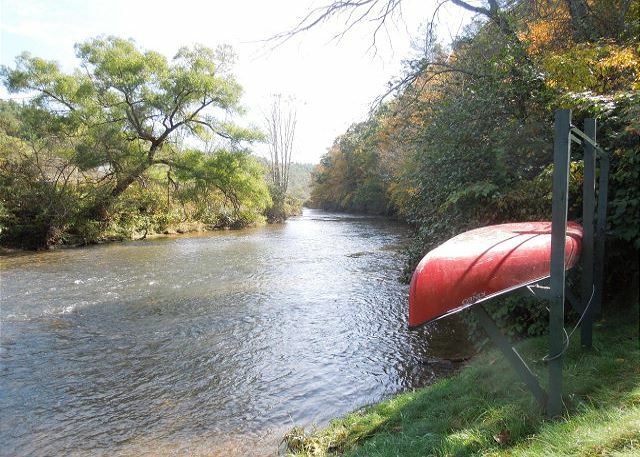 Rent a canoe or tubes and ride the river! It's only a couple of miles down the road. Try your hand at fly fishing in the river at dusk! You're sure to enjoy the gentle country animals on the way in! Take a stroll along mountain pastures and enjoy the fresh air and mountain views! View the mountains in all their Autumn color and glory! A winter view from Above It All. The interior offers breathtaking panoramic long range view and features French doors leading out to the wraparound deck. The great room features two leather sleeper sofas, a wood burning fireplace, a 50 inch TV with Satellite, WiFi and a Foosball table - providing a relaxing getaway! A fully equipped kitchen makes preparing meals a snap. Don’t want to stay inside? Grill a steak on the charcoal grill on the deck while enjoy the mountain views. 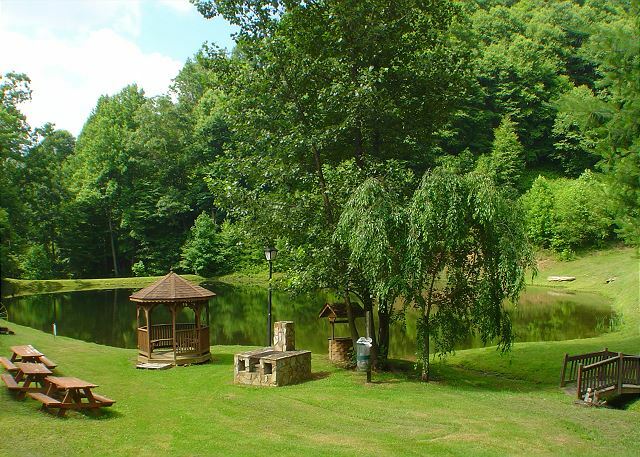 You certainly don’t need to leave Above It All to have a wonderful vacation, but you if do the cabin is close to Grayson Highlands State Park, the world famous River House restaurant, and the New River for a day of fishing or canoeing. 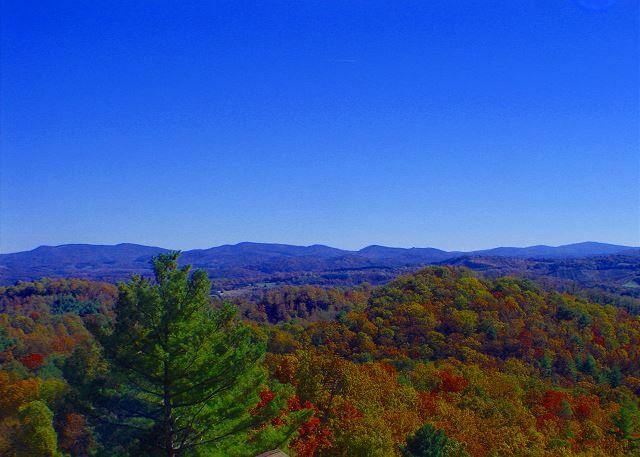 Above It All is a Carolina Mountain Properties & Rentals property. Our calendar and rates are updated instantaneously. We strive to make it as easy as possible to stay at one of our properties. We will notify you proactively when an early check in is possible and you’ll receive the comforts of a luxury home when you arrive with a starter supply of paper products, hand soaps and lotions. In addition, we offer 24/7 emergency after hours service. Carolina Mountain Properties & Rentals uses one of the industry’s most trusted brand of software to securely store all guest data. All of our vacation rentals follow local and state tax rules. Each reservation includes applicable taxes, linen cleaning fee, and a processing fee. Carolina Mountain Properties & Rentals also offers an optional trip interruption insurance to protect your investment. Thank you for leaving a review of your recent stay at Above It All. House was very clean exactly as pictured. There were some dead lady bugs that other guests mentioned -Not a big deal to us and expected… you are in the wilderness there are bugs…. The views from the house are incredible! This is not one of those houses that sits on the side of the main road. Expect a little bit of a drive. The Community Pond pictured is down the mountain just a little ways away and there is another house that sits below, however it is very peaceful. Warning – if you have AT&T cell service you will lose all signal in the mountains very quickly and will not be able to call in (or Receive texts) for your access code for check-in. Certainly, I am not the first person this has happened to, but it was never mentioned to me by the rental company. Luckily a nice lady working the register at Citgo let me call on her personal cell phone and all was good, but wished this would have been addressed earlier. Would also suggest you download a map of the area for offline viewing via google maps. It’s not perfect but we found it to be very helpful in our trips to see the ponies at Grayson Highlands and the Creeper Trail. The living room was very roomy – could use some extra seating in addition to the two sofas for when the weather does not allow the porch. (Would not suggest the sleeper sofa for adults our kids were fine but the mattresses are very thin, although the couches themselves were very comfy for sitting). The kitchen was very clean, but is extremely basic in stock. The views from the deck are incredible, but if you plan on sitting, the view is obstructed by the deck railing once you lean back into those uncomfortable plastic Adirondack chairs. Owners would suggest you replace them with rockers or other chairs that sit higher up so you can enjoy and maximize the view. We absolutely had an incredible trip, and even with all the little things mentioned above we would stay here again. We are thrilled to hear that you enjoyed your stay at Above It All. Cell phone service can be spotty based on the different carriers. We will also check into getting some more comfortable outdoor seating. We certainly hope you will stay with us again in the near future. So glad to hear that you had a relaxing stay at Above It All. Unfortunately during this time of year, ladybugs are attracted to warm, sunny surfaces, such as the sides and roofs of buildings. They accidentally enter inside by tiny cracks and window runners. Scores of removals have been undertaken, only to have them reappear in less than a day's time. These insects only live a short time and therefore you may find dead ladybugs in the cabin. Rest assured that your cabin was cleaned before your arrival, though you may find a few dead lady bugs. Beautiful views. Very relaxing and peaceful. On a clear morning you can see the sunrise to the east coming up over the mountains. The cabin was clean and has all the amenities one could want in a mountain getaway vacation, including WIFI if you still need some connection to the world you left behind temporarily. This was our first time but going forward, this location will be a frequent getaway for our family. Splendid location and amenities. Nestled away in the mountains with spectacular views. 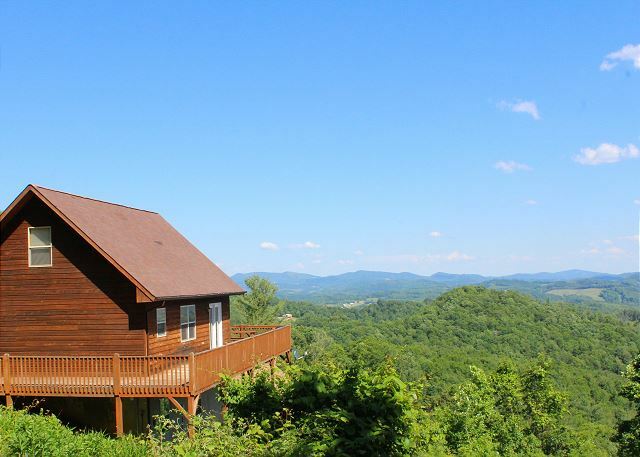 It's a beautiful cabin perched up on top of a mountain, and it has a gorgeous 90 degree view to the east and south (you can see the sunrise). The cabin itself was stocked with a small supply of all the essentials (dish soap, toilet paper, cork screw, laundry detergent, kitchen towels, etc.) so it's a relief not to have to pack all of those things. Grayson Highlands Park is about 30 minutes away, and New River State Park is maybe 15 minutes away. I wouldn't want to drive up there in the snow or during an intense thunderstorm, but our little Toyota did just fine on the winding country road. I also don't recommend checking in after dark, unless you've been there before -- this cabin really is tucked away. I'm looking forward to going back on a clear night when the stars are out in full force. We loved the cabin and it's location. The view was fantastic. The staff was very courteous and most helpful. Peaceful, private, and a great view. We had a great stay. We enjoyed the breath-taking views in the mornings accompanied by the songs of many different birds. The location is peaceful and the people, when you see them, are laid-back and friendly. The cabin was spacious and spotless, everything worked fine, and the new hardwood floors and leather couches made the place look new. Tastefully decorated. The rental management was friendly and on the ball-- the compressor on our central air-conditioner broke, and was repaired on the same day we called it in.